In December 2014, I set out to hike the California Riding & Hiking Trail in Joshua Tree from Blackrock Canyon to Juniper Flats and back. The 36 mile out and back overnight trip would be my first solo backpacking adventure, and my first time hiking in Joshua Tree. I learned a lot of valuable lessons on that trip, not the least of which was the importance of properly estimating and managing my water consumption on a long hike. While I didn’t run out of water, I did make a series of mistakes on my hike that eventually led to me becoming dangerously dehydrated. If you’ve ever been uncertain about how much water you should carry on a hike, or worse yet, you run dry more often than not, then continue reading. 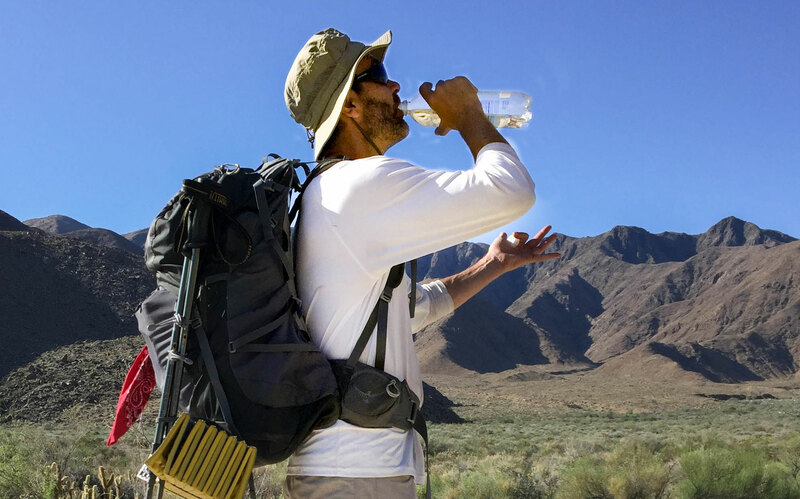 This article will identify several important things to consider before your hike so that you don’t end up dehydrated on the trail. The longer you track this information, the more accurate your baseline will be for estimating your water needs on future hikes. After more than three years of tracking my hikes, I know that I hike between 3 and 3.5 mph, and drink about ½ liter of water per hour on average. With that information, I know that I will drink about 1 liter of water on an average 6 mile hike. Everyone is different, so it is important that you track your hikes so that you can estimate your water needs accurately for yourself. Also, it’s important to keep in mind that this is only a baseline average to be used for estimating. Other things, like weather and the difficulty of a hike, need to be considered as well. To establish your hiking pace, you need to know how far you hiked and how long it took you to complete that hike. I track all my hikes using Runkeeper and/or a GPS device. Any running or fitness app will do as long as it gives you accurate results. At the beginning of every hike, you should know exactly how much water you are carrying when you hit the trail. When the hike is over, make a note of how much water you have left over, if any. The difference between what you started with and what you have left over, is the amount of water you used on your hike. Now that you know how much water you will drink on an average hike, it’s time to start thinking about other factors that can affect how much water you will need to carry on a particular hike. This is not to say, however, that just because it’s cold or humid outside you will drink less water than you normally would. You need to take everything into consideration and adjust your water estimates accordingly. And if you’re inexperienced hiking in a particular environment, then take more water than you normally might, just to be on the safe side. When it comes to water, always err on the side of safety. If you know you’re going to need more water than you’re willing or able to carry, then you need to plan ahead for refilling your water supply. Many times you will be able to refill your water supply using natural water sources in the environment. Lakes, rivers, streams, creeks, and even a small trickle coming from the rocks can all serve as the perfect spot to fill up. I’m not going to get into filtering or treating water here. That’s a complex (and somewhat controversial) topic all its own. What I will say is that it’s always important to know that the water you’re drinking is free of harmful viruses and bacteria before drinking it. Many major natural water sources can be found by simply looking at a high quality topo map. Some may be year-round, while others may be seasonal, so it’s important to know which is which if you’re going to be hiking off-season. Things don’t always go as planned, though, so it’s a good idea to double check on your water sources by calling the ranger station before you set out on your hike. Here in Southern California, it’s not uncommon for water sources to be unseasonally dry due to drought conditions. Rangers are always happy to let you know where or if you can find water along the trail, because the last thing they want is to lose a hiker to dehydration. Some parks, like the Grand Canyon, have water taps scattered throughout the park. They are usually located in or near campgrounds along the trail. Most topo maps will indicate where these water sources are located, as will the maps you can pick up at the visitors center. Just as with your natural sources, it’s always best to check with the ranger station ahead of time to make sure the taps are in working order. Often they will be seasonal and only turned on during peak times of the year. And, just like the pipes in your house, they are subject to leaks, including catastrophic failures, resulting in emergency shut-downs. Be safe and call ahead. Some parks will allow you to cache water for yourself before heading out on your hike. This is particularly helpful in places like Joshua Tree where there are limited man-made water sources, and no natural water sources available to hikers. Typically, you just head in before starting your hike and find a hidden spot somewhere near the trail along your route to leave some water for yourself. Not only can water caching make it possible to carry less water and save weight, but it can also make it possible to extend your hike for as long as you want to stay out. The rules are different for every park, and not all parks allow water caching, so just as before, give the ranger station a call to make sure you’re not breaking any rules.